Prehypertension is a term used to describe blood pressure that is higher than normal but not high enough to be considered high blood pressure - more than 120/80 and less than 139/89. Symptoms: Prehypertension does not have any symptoms. The only way to detect prehypertension is to keep track of your blood pressure readings. Causes: It can be stress, diet, and lack of exercise, fats, processed foods and lack of proper sleep. Also medications for birth control, cold remedies, decongestants, over-the-counter pain relievers and some prescription drugs may cause prehypertension. 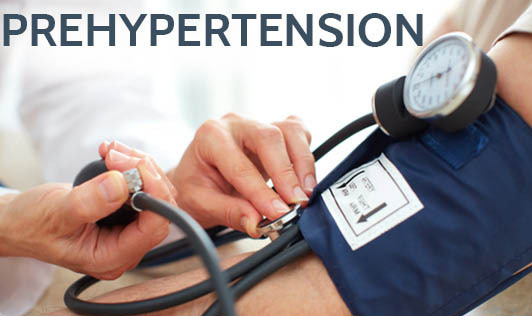 Certain chronic conditions - including high cholesterol, diabetes, sleep apnea (abnormal pauses in breathing), kidney disease, thyroid disease and adrenal disease may increase the risk of prehypertension as well. Treatment: Always seek professional medical advice about any treatment. • Maintain a healthy weight - If you're overweight, losing even 2 kgs can lower your blood pressure. • Eat healthy foods - Choose fruits, vegetables, whole grains and low-fat dairy foods. • Reduce salt in the diet. • Increase physical activity - Regular physical activity can help lower your blood pressure. Include at least 30 minutes of activity a day. • Prefer a low-fat diet.